I hope you will have fun hopping around to everyone and looking at what they have created, and I am sure we would appreciate it if you left us some love as you passed through. Since there is no IKE'sWORLD Challenge this week, we are having a bit of fun with the hop. Do you fancy winning one of the New images???? 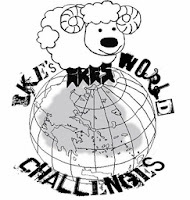 All you have to do is go around the hop and leave everyone a comment and then go back to IKE'sWORLD Challenges and leave a comment saying that you've done that, how simple is that? OMG - What a beauty! Stunning, love how all the black makes the image pop. Such a wonderful tassel and bow, not to mention your wonderful coloring. Simply beautiful Ginny. Your colouring is awesome and I love that the image is the true focal point of the creation. She looks wonderful against the lovely background you have created for her. Well done as always. This is absolutely gorgeous. I love the colouring of the image, you have given her a really beautiful complexion with those rosy cheeks. The backing is beautiful and I love the detailing in the embellishments. The lovely image colouring is very lovely against that bold striking backing. soooo beautiful! Love the use of the tassel!!! And the DP is perfect. Just stunning!!! I've seen this image a few times. Very pretty. Very pretty, love the laces and trim, beautiful coloring of Really! Nice embossing on the black or great dp if it came that way. Lovely lace goes wonderful w/ this image. So pretty. Fabulous card and always so elegant. Your style makes me happy. hugs! Stunning card! Love the lace and that gorgeous bow.